This represents '#pragma omp requires...' directive. Definition at line 345 of file DeclOpenMP.h. Definition at line 383 of file DeclOpenMP.h. Definition at line 385 of file DeclOpenMP.h. Definition at line 382 of file DeclOpenMP.h. Definition at line 384 of file DeclOpenMP.h. Definition at line 405 of file DeclOpenMP.h. Definition at line 406 of file DeclOpenMP.h. Definition at line 396 of file DeclOpenMP.h. Definition at line 398 of file DeclOpenMP.h. Definition at line 388 of file DeclOpenMP.h. Definition at line 397 of file DeclOpenMP.h. Definition at line 401 of file DeclOpenMP.h. Definition at line 387 of file DeclOpenMP.h. Referenced by clang::ASTDeclWriter::VisitOMPRequiresDecl(), and clang::ASTDeclReader::VisitOMPRequiresDecl(). Definition at line 390 of file DeclOpenMP.h. Referenced by clang::CodeGen::CGOpenMPRuntimeNVPTX::checkArchForUnifiedAddressing(), clang::ASTDeclWriter::VisitOMPRequiresDecl(), and clang::TextNodeDumper::VisitOMPRequiresDecl(). Definition at line 393 of file DeclOpenMP.h. 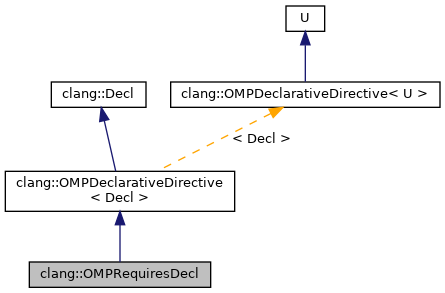 Definition at line 104 of file DeclOpenMP.cpp. Definition at line 115 of file DeclOpenMP.cpp. Definition at line 348 of file DeclOpenMP.h.